Western Dedicated Freight Corridor (WDFC) spans across 1499 km in six states starting from Dadri, NCR and ending at JN Port, Mumbai; 553 km length of which passes from the State of Gujarat. 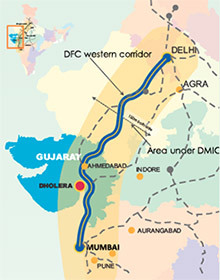 Dedicated Freight Corridor Corporation of India (DFCCIL) is a Special Purpose Vehicle set up under the administrative control of Ministry of Railways to undertake planning & development, mobilization of financial resources and construction, maintenance and operation of the Dedicated Freight Corridors. DFCCIL was incorporated in October 2006. Dedicated Freight Corridor Corporation of India Limited (DFCCIL) is a Special Purpose Vehicle set up under the administrative control of Ministry of Railways to undertake planning & development, mobilization of financial resources and construction, maintenance and operation of the Dedicated Freight Corridors. DFCCIL was incorporated in October 2006 under Indian Companies Act 1956.